The ultimate in lightweight packability, this jacket packs into a small pouch concealed in pocket. Patented Motion-Tuned technology, including expansion back pleats. Snap off sleeves for quick conversion to half-sleeve jacket. From the Packable rainwear collection. Fabric combines breathability and durable wind and waterproofness with an unlined design for ultimate lightweight packability. Patented Motion-Tuned technology for comfort and full freedom of moevement in all conditions for soft and quiet all-weather play. 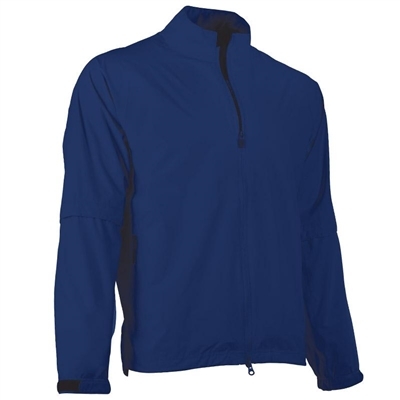 Men's Packable Long Sleeve Waterproof Jacket. Call for pricing discounts for orders over 2 dozen. Zero Restriction 0192C REPLACES 0134 - SAME JACKET BUT COLOR WEDGE ON SIDE IS GONE- NOW ALL SOLID COLOR. Sizes:SM-2XL Matching ladies styles are also available. Zero Restriction Waterproof Collection Zero Restriction is the number one brand of outerwear on the Tour and fast becoming a favorite of American business looking for unique ways to present their brands and enhance their recognition. Zero restriction has taken outerwear to the highest level of technological and fashion-forward design with patented design elements, leading-edge fabrics and innovative features that are profoundly functional and comfortable in any weather. Zero restriction is the ultimate complement to your company's highly developed brand image. No outerwear line can make a more powerful or lasting impression with key customers, important clients, business associates or employees. Logo embroidered jackets ship from factory about 5 days after approved order. Optional personalization. A one color embroidered logo with matching color thread looks great! Embroidery is included in price for up to 10,000 stitches- this includes steaming, fold, pin, tissue, polybag plus style and size sticker.